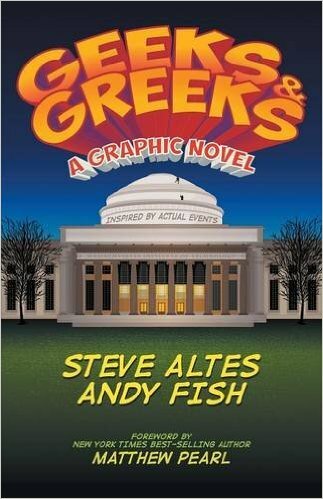 Review Fix chats with Steve Altes, writer of Geeks & Greeks, an inspired-by-actual-events story about high-tech pranks and hazing at MIT. Geeks & Greeks was written by humorist Steve Altes, illustrated by Boston-area artist Andy Fish and colored by Marvel Comics artist Veronica Fish. It was inspired by MIT’s world-famous hacking culture and real-life hazing incidents Altes witnessed as an MIT student. Altes describes it as Good Will Hunting meets Animal House. Review Fix: What inspired this graphic novel? Steve Altes: When I was an MIT student in the 1980s I’d tell my friends back home about the pranks and hazing that went down at MIT. They were always shocked, amazed and alarmed. It got me thinking that if I could find a coherent through line and emotional journey to hang these incidents on, I’d have a pretty decent story. The story started out as a screenplay and generated some Hollywood heat for a time. Heyday Films, the people behind the Harry Potter movies, were interested in making it. But the project never got the green light. For a while I considered adapting it as a novel, but I felt the events needed to be seen, not just imagined. It’s a fast-paced story with lots of chasing, smashing, exploding, climbing, rappelling, and plummeting. Finally it dawned on me… Geeks & Greeks ought to be a graphic novel. Like film, graphic novels are a visual medium. A graphic novel is a movie shot with ink and paper. So I pivoted. I believe in being persistent about your goals but flexible about your methods. Review Fix: What was it like to work with your illustrator, Andy Fish? Altes: Andy and I just tickle each other’s funny bones. He gets a kick out of my writing. And I’m in love with his art. It was truly a dream collaboration. Andy had the three most important things I was looking for in an artist: talent, passion, and proximity. His talent is off the charts. He’s written dozens of graphic novels and how-to books on illustration. He totally understood what I was trying to do and immediately committed to the project. And the fact that he lives near Boston meant his drawings could be informed by visits to the actual sites of these actual events. I sent him the script, complete with thumbnail panel layouts, and he drew the pages and sent them to me for notes. We spent months polishing and revising the art because Andy was always finding new ways to add more humor to the panels. And we were determined to squash any inaccuracies since our core audience of techies are bug-finders by nature. Review Fix: What comics did you read as a kid? Altes: Growing up in the Silver Age of Comics I just devoured comics. Read them constantly. Mostly DC. Batman, Superman, Detective, Action, Adventure, Legion of Super-Heroes. I slept with towering stacks of them on my bed. Tragically, when I left for college my parents sold my comic collection in a garage sale for a nickel each, including Amazing Spider-Man #1 (1963). If I have to put them in a discount nursing home, that’ll be the reason why. Review Fix: Who do you think will enjoy it the most? Altes: 17th century Flemish painters, angry hobos, sentient robots and the terminally ill.
No, but some people do ask, “Is this story going to appeal to people who didn’t go to MIT?” To which I say, you didn’t have to attend a Vermont prep school to enjoy Dead Poets Society. In the same vein, I wrote Geeks & Greeks to have broad appeal. Review Fix: Bottom line, why should someone read this? Altes: For me the best stories come from people who’ve had unusual adventures in highly-specific arenas. They bring an authenticity to the dialogue and the irrefutable confidence that comes from actual lived experience. Like Tom King, a former CIA operations officer in Iraq, who produced the acclaimed graphic novel Sheriff of Babylon. With Geeks & Greeks I’m bringing a story from the trenches of my own experience. In fact, the greatest compliment I’ve received came from an Amazon reviewer who said he didn’t think any of this happened. The events were too outlandish for him to believe. That’s confirmation that this story needed telling. And it’s why I included 120 endnotes that document the real-life origins of nearly every event in the book. Altes: Andy and I are hard at work on a new graphic novel called The Skeptic. It explores the question: “What if the world’s most famous skeptic and debunker of paranormal phenomena suddenly started seeing UFOs, Bigfoot, the Loch Ness Monster, and other supernatural creatures?” I plan to run a Kickstarter for it this fall. Plus I’m writing a sequel to Geeks & Greeks. Working title: Geeks & Greeks, Vol. Square Root of 4. I can’t help myself. The characters have become so real to me that I hear their voices all day long. Altes: In case any prospective college students or their parents are reading this, I want to say that the atmosphere at MIT has changed completely since I was a student. It’s true some MIT living groups had an Animal House mentality in the 70s and 80s, but that era is long past. While the playful spirit of hacking continues to thrive at MIT, many of the more abusive impulses of its living groups have toned down. Fraternities in particular have been forced to adapt to changing societal norms. The worst offenders have had their charters suspended or revoked and, across the board, a more mature attitude has taken hold. Today’s MIT student is more concerned with inventing the Next Big Thing, starting a company, and changing the world than engaging in some of the more destructive hijinks recounted in Geeks & Greeks.